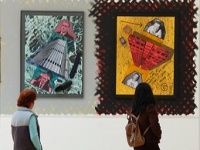 In the heart of the city, the Leeds Art Gallery offers a feast for art lovers, its collections covering everything from traditional prints, watercolours, paintings and sculpture to weird and wonderful contemporary works. The gallery is renowned for having the best collection of British art outside of London - a fiercely contested accolade. Adjoining the gallery is the Henry Moore Institute, with its acclaimed sculpture study centre, and a full programme of sculpture exhibitions that run all year round. There is no admission charge for the Leeds Art Gallery and the collection could easily captivate visitors for a few hours.